Google Blog Search has been boring has compared to other blog posts showcase services. Google has not given up on Blog Search yet. While the main blog search content remain same, it has added two new features “hot queries” and “latest posts”, to throw some interesting content “in your face”. 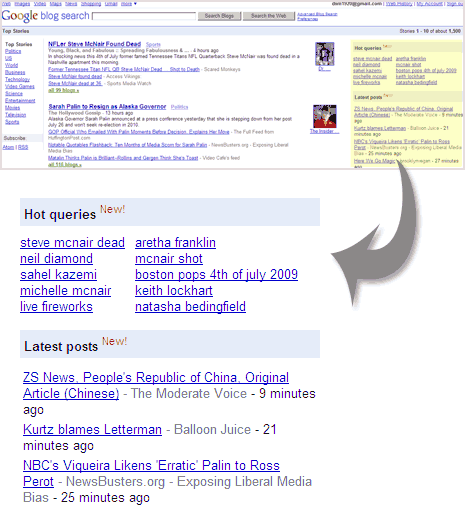 Hot queries lists hot keywords users have been searching, while latest posts show new posts from top blogs from different categories. These new feature preps up the right side of the Google Blog Search. Finally, Google thought of using blank space on right to show some dynamic content. Now with more content and dynamic looking right sidebar – Google Blog Search looks promising (a little). They for sure need to innovate and add newer features to keep users glued!